Graphing calculators are an ideal platform on which to learn programming, because most high school students in the US already have them, carry them around in school and commuting, and can whip them out to work on their latest projects. You don't need to download, install, or configure anything; just hit [PRGM] on most graphing calculators, and you can instantly start writing TI-BASIC (or a similar language) directly on the device. You don't have to worry about breaking the calculator: make a mistake, and it'll probably help you find where you made a mistake, and what you did wrong. Calculator programming adds an element of competition, and has done so before the term "social media" had even been coined: you can send your programs to your friends' calculators, get the prestige of having created a cool program or game from scratch, and look at how things other people made work. Finally, as you get more advanced, you can advance to a more complex language like C or ASM that lets you go even deeper into concepts like computer science and computer architecture, or even electrical engineering. CALCnet Networking Demo: Four TI-83 Plus calculators connected via CALCnet, running the Flourish demo, showing how you can build and test a complex communication protocol with just the hardware your calculators provide, plus a few wires. GPS Demo: A version of the GPS for graphing calculators project, allowing a calculator to communicate with a GPS module to get its latitude, longitude, altitude, the current time, and more. SimpleI/O Demo: First displayed this year at T^3 2016, the SimpleI/O demo illustrates how easy it is to connect an Arduino to a graphing calculator. It shows how a calculator can read the state of pins on an Arduino to see if you're pressing a button or toggling a switch, and how the calculator can in turn control LEDs, motors, and more. "Using the TI-84 Plus" and "Programming the TI-83 Plus/TI-84 Plus": As has become traditional, we brought copies of my books as examples of written reference material that new learners could explore outside of Cemetech. "Programming the TI-83 Plus/TI-84 Plus" teaches programming concepts to beginners via TI graphing calculators, giving them a toolbox of programming knowledge they can bring to any programming language. "Using the TI-84 Plus" is the missing manual: a gentle guide to the vast array of math and science features available on TI graphing calculators, grounded in plenty of examples just like the ones students might see in class or on the SATs. Unfortunately, although we wanted to display the TI-84 Plus Calculator Electrocardiogram (ECG) project I've recently been working on, it wasn't ready in time for the Faire. 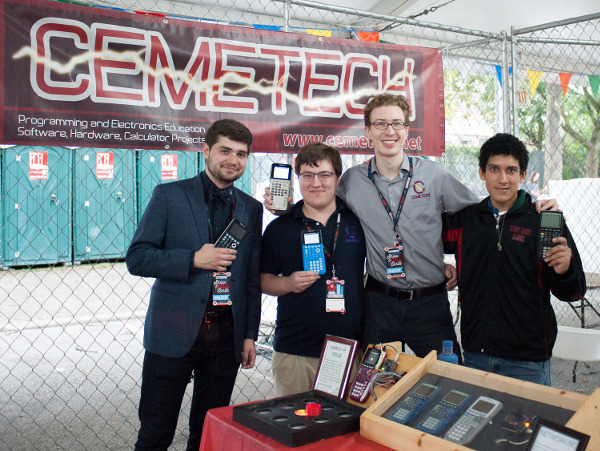 All of this year's volunteers at the Cemetech booth were veterans of at least three World Maker Faires. From left to right above, our booth was manned by Nathaniel "Eeems" van Diepen, also an administrator on Omnimaga, Tim "geekboy1011" Keller, Cemetech global moderator, community liason, and Omnimaga jack-of-all-trades, Alec "qazz42" Szigeti, loyal Cemetechian who has attended every single Maker Faire with us, and head honcho Dr. Christopher "Kerm Martian" Mitchell, founder and administrator of Cemetech and yours truly. Everyone pitched in wholeheartedly, whether talking to the thousands of visitors who stopped by our tables to explain Cemetech's mission and why we were at the Faire, keeping our demos running, or protecting the interactive calculators from the destructive hands of small children. We combined exhausting 10am-6pm days at the Faire (more like 8am to 8pm with travel, setup, and teardown) with our annual traditions of socialization, dinners, and enjoying each other's in-person company. As always, most of us also stopped by Maker Faire on Friday night to start setting up, get paella, beverages, and tasty desserts, and start setting up our booth. By the end of the weekend of October 1-2, 2016, we had given away all of our Cemetech bookmarks (a first for us! ), worn out our voices, and explained graphing calculators to visitors young and old. Most importantly, we left satisfied that we had opened many more eyes about the value of exploring programming and electronics with calculators, and excited to see some of our more enthusiastic visitors again here on Cemetech. My heartfelt thanks to everyone who helped make our fifth World Maker Faire appearance a resounding success, especially Tim, Nathaniel, and Alec who joined me for two long days of telling students, teachers, parents, professionals, and the general public why they should learn programming and electronics with their graphing calculators. The encouragement of everyone here on Cemetech was a big help as well, and several of you stepped up and offered to share the burden of preparing for the Faire. I hope that we'll see as many of you as possible as attendees at the Faire next fall, and if you're interested in helping staff the table, please speak up! Indeed, Nathaniel/Eeems was especially helpful this year in his role as our official photographer; the headshots in the OP were his work, and the group photo was mostly taken by him (he set up the camera and the scene, and asked a friendly passerby to focus and take the photo). I'm very excited to see the results, even if I was weirded out by his several pictures of me eating. Looks great guys! Looks like you guys interacted with tons of people, hopefully they left educated and with a higher opinion of graphing calculators! Geekboy going for that hover hand. We did indeed; as is increasingly the case, the vast majority of our visitors were enthusiastic and understood what we were doing. We had a record low number of "why would you bother doing that?" or rants about how evil graphing calculators are. © Copyright 2000-2019 Cemetech & Christopher Mitchell :: Page Execution Time: 0.509234 seconds.